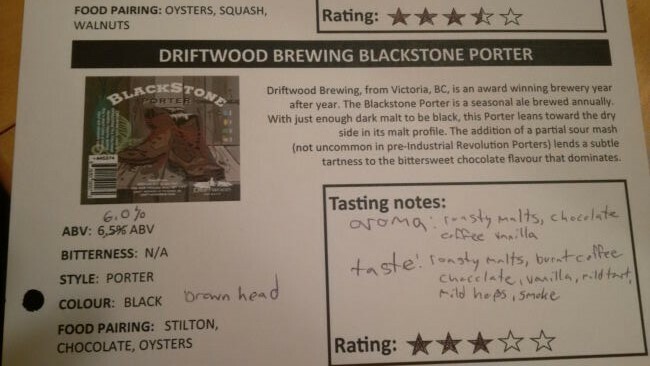 From Victoria BC’s Driftwood Brewing comes the “Blackstone Porter” a winter seasonal. The porter pours black with a brown head. The aroma consists of roasty malts, chocolate, coffee and vanilla. The flavour is of roasted malts, burnt coffee, chocolate, vanilla, smoke with some mild tartness and hops bitterness. The alcohol content of this beer is 6% up from last years 5.1%. The mild tartness pairs very well with all of the other flavours in this beer. This is a really interesting beer to be sure. Commercial Description: With just enough dark malt to be black this Porter leans toward the dry side in its malt profile. The addition of a partial sour mash (not uncommon in pre-Industrial Revolution Porters) lends a subtle tartness to the bittersweet chocolate flavour that dominates. Food Pairing as per brewery: Oysters, smoked foods, barbecue, mushrooms, onions, rosemary, thyme, cheeses like stilton, caerphilly, aged cheddar, chocolate, pecans. This entry was posted in Porter and tagged bc, beer, bitter, bitterness, burnt coffee, canada, chocolate, coffee, hops, hopy, mild tartness, porter, roasted malt, roasted malts, smoke, tart, tartness, vanilla, victoria. I think I have yet to try this one. Don’t know what it is about porters and stouts, but I seem to have a bit of a mental block when it comes to them. Better get on trying this one. It’s great.